Every 67 seconds, someone in the United States develops Alzheimer’s disease. If you or your loved one are one of those 1,200 people every day who have been diagnosed, know you are not alone. We’ve discussed before that hiring a caregiver can be an emotional, and sometimes hard, decision. Here we highlight the importance of a specialized caregiver when caring for someone with Alzheimer’s. Get the facts. Alzheimer’s is a result of the brain’s generalized degeneration and does not yet have a cure. It is a progressive disease that affects memory, behavior and other mental functions. Take it all in. The facts about Alzheimer’s can take a toll on your emotional health. The expectation of future changes can cause anger, depression and even fear. If you’re experiencing any emotions similar to these, take the time you need and then spring into action. Create a support group. These people will help you along the road ahead. They can include friends and family, neighbors and a variety of health care providers, in addition to your doctor(s). They should be people you are comfortable confiding in and relying on and that you trust. Accepting help isn’t admitting defeat. Calling in the cavalry doesn’t mean forfeiting your independence or succumbing to babysitting. Help comes in all forms; you don’t have to jump into 24-hour, round-the-clock care if you’re not ready for that. ‘Any old caregiver’ won’t cut it. The Certified Nursing Assistants (CNAs) and Home Health Aides (HHAs) at Granny NANNIES specialize in Alzheimer’s care and are pre-trained to support Alzheimer patients. Their credentials, national criminal background, references and physical condition are verified and stringently screened. 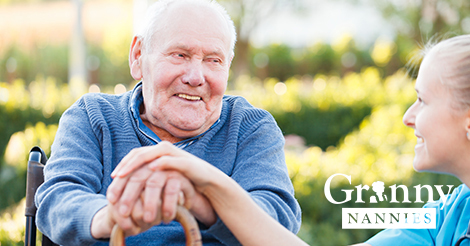 Overall, we require they elicit the kindness and compassion needed to care for you and your loved one. Our care isn’t just focused on the physical. Brain games, such as crossword puzzles and word searches, are proven to help stimulate the mind. The CNAs and HHAs at Granny NANNIES will engage the cognizance of you or your loved one to keep them sharp as long as possible. In addition, conversation in topics that you or your loved one find interesting and meaningful will keep the brain active to slow down any further degradation. You shouldn’t take care of yourself or your loved one alone. Just because you can, doesn’t mean you should. According to the Alzheimer’s Association, nearly 60% of Alzheimer’s and dementia unpaid caregivers rate the emotional stress of caregiving as high or very high. Rely on a trained eye. The CNAs and HHAs at Granny NANNIES can monitor the effects of Alzheimer’s and modify care regimens to better reflect which stage of the disease you or a loved one are in. They will ease stress and keep the doctor or health care provider informed on any developments or changes. Relinquish other responsibilities. Activities such as housekeeping, meal preparation and grocery shopping can fall to the wayside. Transportation may also become difficult. Your CNA or HHA is there to assist you or your loved one however you may need. Whatever you’re feeling is okay. Confide in someone who provides you with emotional and spiritual support. CNAs and HHAs are available to help educate and comfort if need be. Granny NANNIES is a home health care provider offering home care services for individuals of any age or with any need as desired, up to 24 hours a day, seven days a week. Founded in 1990, Granny NANNIES maintains a commitment to excellence and a strong dedication to treating clients with the highest level of respect and dignity. For quality, trustworthy, reliable and affordable care, Granny NANNIES is there. For more information, call 800-316- 2669.